I love poppers. You know, those deep fried jalapeno’s with cheddar or cream cheese in them? :o) I just don’t love the calories. 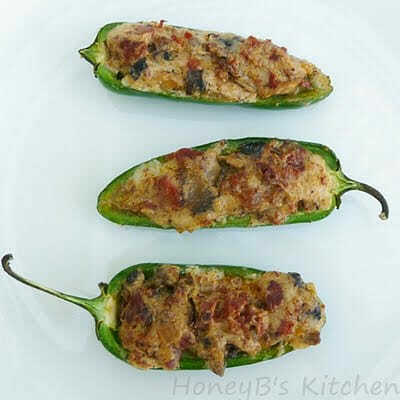 I’ve been eyeing the recipe in Cook This, Not That for Stuffed Jalapenos. They looked so appealing in the book I had to make them. I knew Grumpy probably wouldn’t eat them but I still wanted to make them. However, these were not as spicy as I expected….if spicy at all! Maybe my heat tolerance just keeps getting stronger. The peppers before cooking had heat but after they were cooked, I just couldn’t feel the heat like I did before cooking. The filling? These were definitely worth heating the kitchen up for however you could probably cook them on the outdoor grill also. I traded heating the house up some rather than being outside in the heat. At least I have AC and could go to a different part of house to keep cool – or stand near the AC vent! I would definitely make these again. I have never used chorizo in cooking although every time I would watch Rachel Ray use it I would think I need to try this stuff! This recipe was my chance. I looked for two weeks before I finally found it though. I literally found a vegetarian version before I found the real thing! Chirozo is some good stuff! If you can’t find it, you could use any other type of sausage…turkey sausage would work and you can use any flavor sausage (like the Buffalo Chicken Sausage..yum!) you like in my opinion! Cook the chorizo over medium heat, stirring with a wooden spoon, until oils begin to release and sausage starts to crisp up. Remove chorizo from skillet. Place mushrooms and onions in skillet and saute until waters release and onions become transparent. Return chorizo to skillet and stir to combine. Remove from heat. Measure out cheeses and add sausage mixture, stirring to combine. 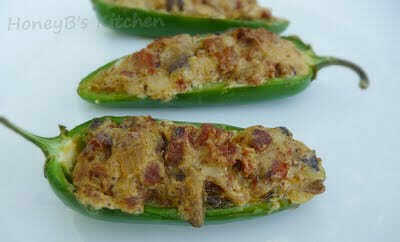 Stuff each pepper with a spoonful of the cheese mixture and bake 15 minutes. Compared to: Not That–>On the Border Firecracker Stuffed Jalapenos with Original Queso – 1,950 calories , 134 grams fat, and 6,540 mg sodium in one serving! Making this recipe saves 1700 calories! I love stuffed peppers and I love poppers too! These are over the top and look delicious! 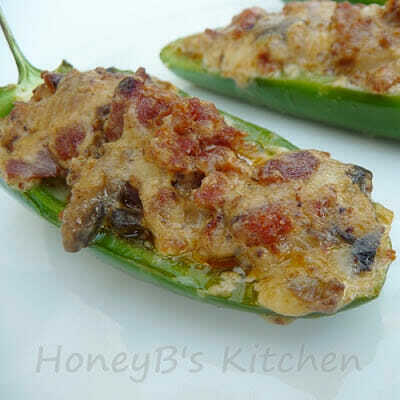 I really love jalapeno poppers but I almost never eat them because, as you said, the calories. So it's exciting to see a great better-for-you recipe for a favorite like this! Thanks Shelby. These look delicious! I have a bunch of jalapenos in my garden too. I love poppers too. How great to have a healthier, delicious version. oh man these sound absolutely delicious!! My garden is exploding in jalapenos! Oh Shelby these look amazing!!!! fantastic and calorie saving ?. bonus! It's been too long since I've made stuffed peppers. What a great recipe, Shelby! Ya know, I love stuffed peppers but whenever I make them, I always fight to get the stuffing inside. Piping it isn't too bad, but it's still not all that convenient. I like the idea of cutting them in half length-wise like this a lot better. This would be a hit in out home, looks wonderful. Mmmmmm…would love to try those on the gas grill. it's embarrassing to admit this, but i've never had a popper. after this post though, i want one! Definitely one of my favorite appetizers. They are great on the grill (wrapped in bacon of course). Great recipe, great pictures (as usual). I love poppers too. So glad to have found a new variation! I'm so glad you posted the recipe. After I saw them on your facebook page I was drooling. 😉 If Grumpy likes the stuffing, they must be good! !